The Queensland government has recently removed long-standing public rights to object to mines. In shades of the Bjelke-Petersen era, Queensland mines minister Andrew Cripps made fundamental changes one minute before the bill was passed by the Parliament at 11:57pm, just shy of midnight. The changes broke promises that Cripps had made repeatedly from the outset of public consultation on the bill and during debate in Parliament that public rights to object to large mines would be retained. The changes sparked blistering criticism. Queensland Country Life described them a “sell out” while broadcaster Alan Jones called the changes “corrupt” and “unbelievable” amidst other colourful language. What objection rights have been lost? 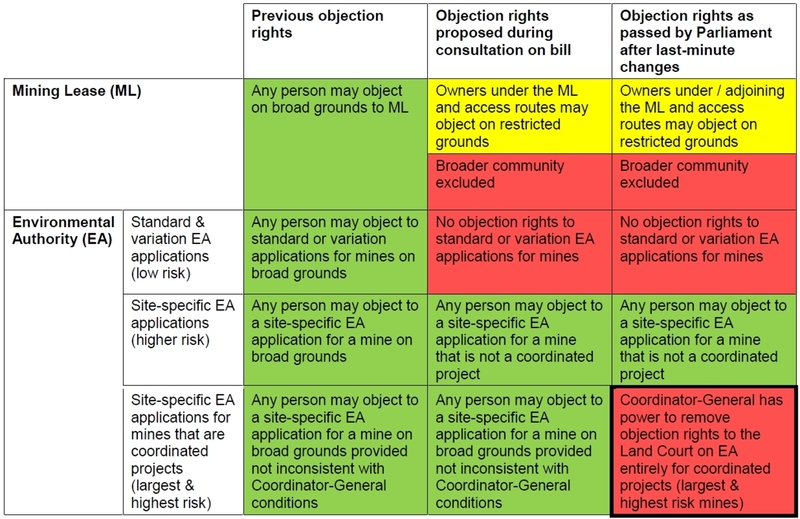 The changes affect public notification and objection rights for the two major approvals needed by a mine at a state level in Queensland: a mining lease and an environmental authority. Large mines and other developments in Queensland can be declared a “coordinated project” by a powerful public servant, the Coordinator-General, whose role is to facilitate the economic development of the State. For many decades in Queensland any person could object against the grant of a mining lease and have their objection heard by an independent court, which then provided a recommendation to the government on the application. The grounds permitted for an objection were very wide and included impacts on the environment and the public interest. This objection right was an important part of the campaign to stop mining on Fraser Island in the 1970s and led to a famous win regarding the concept of the public interest. Prior to the changes, any person could also object to an environmental authority and have their objection heard by the Land Court. Again, the grounds permitted for an objection were very wide and included things like the harm a mine would cause to groundwater and biodiversity as well as noise and dust impacts. In the past, objection rights were only constrained by not allowing challenges to the conditions recommended by the Coordinator-General. However, neighbouring landholders and others could argue the mine should be refused due to its impacts on groundwater or other matters. In practice, few objections proceeded to a full hearing in the Land Court and those that did each year could normally be counted on two hands. For most landholders and other members of the community, the objection process is intimidating and too costly. Objections by landholders and others are invariably a David vs Goliath affair with massive mining companies out-resourcing locals. However, in one recent case involving the massive Alpha Coal Mine proposed by Gina Rinehart’s company and GVK, local graziers and other objectors succeeded in having the Land Court make a primary recommendation that the mine be rejected due to uncertainty about groundwater impacts. This was in spite of the Coordinator-General’s recommendation to approve the mine and federal government approval of it. In early 2014 the Queensland government proposed to confine the objections and notifications process for a mining lease to people owning land within the proposed lease. However, the government said it proposed to continue to allow objections to an environmental authority for large, high risk mines to be made by neighbours and others. In June the government introduced these proposed changes to Parliament in the Mineral and Energy Resources (Common Provisions) Bill 2014. The proposed changes went out for public consultation and hearings by a Parliamentary Committee. The minerals industry supported the changes but the vast majority of public submissions opposed them. The Bill was debated and passed by Parliament on Tuesday September 9. At 11:56pm, one minute before the Bill was passed, the Mines Minister moved a series of amendments. These included inserting a new section 47D into the State Development and Public Works Organisation Act 1971 controlled by the Coordinator-General. The last-minute changes mean that the Coordinator-General can prevent any objections to the environmental authority for a coordinated project from being heard by the Land Court. When combined with the severe restrictions on objections to mining leases, very few people can now challenge matters such as impacts on groundwater of large mines that are declared a coordinated project. A case like the recently successful objection by neighbouring graziers and others to the groundwater impacts of the massive Alpha Coal Mine can not be brought under the new system. None of the objectors in that case owned land on the mining lease or shared a boundary with it. Their main concerns were about regional impacts on groundwater. The Minister did not explain the significance of the changes or state that the changes would reverse earlier assurances to the Parliament. In fact, he repeatedly assured the Parliament that neighbours and the general public would still be able to object to large mines. Table of changes to objection rights. The government’s assurances that the Coordinator-General can be trusted to make a proper assessment of any environmental impacts are difficult to swallow in the light of obvious lack of independence, bias for economic development, and the poor track record in this regard. A well-known example of where the Coordinator-General botched the assessment of a large project is the Traveston Crossing Dam. The Coordinator-General recommended approval of the dam in 2009 but that recommendation was rejected by the Federal Environment Minister who refused to approve the dam due to likely unacceptable impacts on nationally threatened species. In 2013 ABC Four Corners aired an interview with a whistleblower, Simone Marsh, who was employed in early 2010 in the Coordinator-General’s office conducting the environmental impact assessment for large coal seam gas projects. She was stunned when she was told that there was not going to be an assessment of groundwater impacts in the Coordinator-General’s report recommending approval of one of the largest projects. This was apparently done to meet tight timeframes imposed by the proponents. As mentioned earlier, in 2014 the Land Court made a primary recommendation that the massive Alpha Coal Mine be rejected due to uncertainty about groundwater impacts. This was in spite of the Coordinator-General’s recommendation to approve the mine. The Coordinator-General is fast becoming an almost supremely powerful czar for large projects in Queensland, subject only to the political whims of the state government. Under the federal Coalition’s one-stop shop the Coordinator-General is also proposed to have power to approve projects impacting on matters protected under federal environmental laws. It feels as if there’s been a takeover of the Government by the mining industry. It’s a bit like a coup – it’s not a military coup, it’s a minerals coup. More widely, the changes reflect Tony Fitzgerald’s recent comment that power in Queensland has been transferred to “a small, cynical, political class”. Chris McGrath acted pro bono as a barrister for an objector in the Alpha Coal Mine case discussed in this article. He is currently acting in several mining objections and related proceedings for community groups. He is also acting as a barrister for the Queensland Government in an unrelated proceeding.